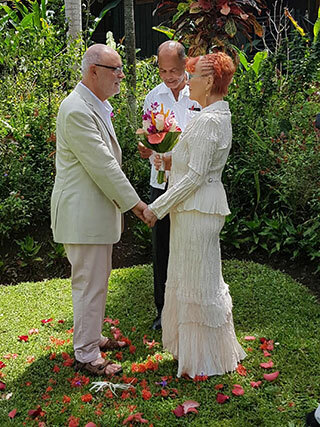 Journalist Peter Johansen and 35-year partner Oxana Sawka renew their vows in the gardens of Negril’s Sunset at the Palms. Sunset at the Palms Wedding Planner Carla Williams took care of all the details. 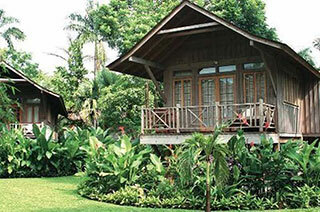 The laid-back Sunset at the Palms offers tree-house style lodgings. Peter and Oxana share a kiss on the beach after the ceremony. That attitude suited us just fine. We spent four nights at the serene all-inclusive resort last week for the renewal of our own vows, marking 35 years of marriage. Williams was busy, stickhandling a wedding on each of the days before and after our ceremony. We also met several couples returning to the resort to celebrate anniversaries of their earlier weddings or honeymoons there. 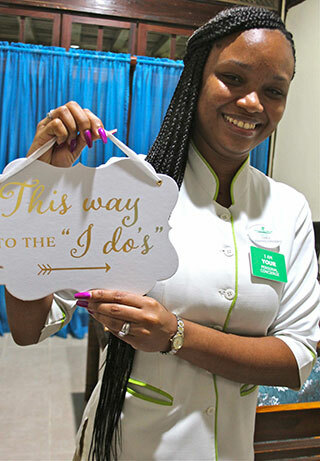 Indeed, destination weddings – and wedding vow renewals – are a popular part of the resort’s business. That’s no doubt due to two factors: the appeal of a property that combines all-inclusive ease with a romantic intimacy lacking in mega-resorts, and the flawless planning that Williams offers every couple. Consider that intimate setting. Sunset at the Palms is nestled in a tranquil 10-acre garden of palm trees, lush foliage and colourful tropical plants. This attracts abundant wildlife: nightingales and hummingbirds, butterflies and tree frogs. Linked by pathways winding through this natural setting are 85 treehouse-style rooms, each with a balcony or terrace from which to enjoy nature’s beauty. But there’s also a private stretch along Negril’s famed 11-kilometre beach that offers warm Caribbean water, pristine white sand, plenty of watersports, a convenient bar and restaurant, and palms for shelter from the sun. This is Negril’s most northerly resort, so its seclusion makes an ideal location for mandatory photos of the bridal party in gently lapping waves – even if, like us, the couple prefers their ceremony to be held in a colourful (and shaded) garden setting instead. The resort is big enough, however, to offer a spa, fitness centre, tennis courts, spacious free-form pool, activities such as mixology and cooking classes, and dining options that range from a constantly changing buffet to an al fresco five-course tasting menu. Williams arranged everything for our occasion – from booking the officiant and photographer to going over our choice of music, wedding cake, bouquet (a burst of tropical colour from her in-laws’ shop) and arrangements for a private candle-lit dinner (with two bottles of sparkling wine) and breakfast in bed. The renewal package, which can include as many as four guests, costs US$279.Our add-ons included my wife’s hair styling and a couples’ massage. Wedding packages range from US$599 to US$2,899, with à la carte extras available. There’s at least one other couple your clients are guaranteed to meet: Betty and Royal Brown. They’re goats, which Sunset at the Palms received from a local farmer in exchange for sending him the kitchen scraps to feed his pigs. Their “marriage” has been productive: two offspring joined the family earlier this year. Guests can even arrange to picnic with them.